McDonald's Shuts Down Website That Told Workers To Avoid Fast Food : The Two-Way The restaurant chain pulled the plug on the website after what it said was "unwarranted scrutiny and inappropriate commentary." 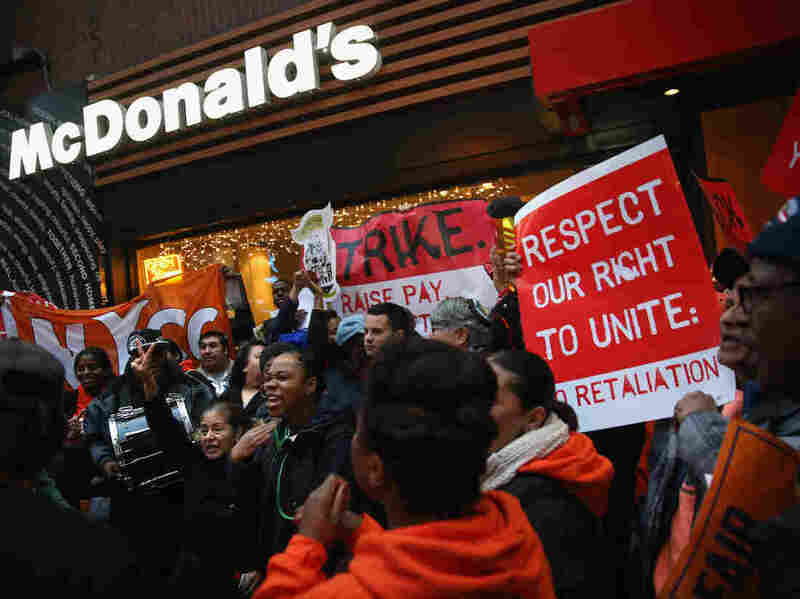 Protesters demonstrate at a McDonald's in New York on Dec. 5. Protesters staged events in cities nationwide, demanding a pay raise to $15 per hour for fast-food workers and the right for them to unionize. McDonald's has decided to shut down a website aimed at providing work and life advice to its employees after it was reported that it had urged workers not to eat the very fast food they are hired to produce. The Oak Brook, Ill.-based McDonald's said Thursday that information on its McResources Line site had been taken out of context thus generating "unwarranted scrutiny and inappropriate commentary," according to a McDonald's spokeswoman. On Monday, CNBC reported that McDonald's had posted on the site an illustration of two meals — one that looked suspiciously like the company's own double cheeseburger offering, complete with soft drink and fries, that was labeled "Unhealthy choice." Next to it was another illustration showing a submarine sandwich, salad and a glass of water, labeled "Healthier choice." "Although not impossible it is more of a challenge to eat healthy when going to a fast food place. In general, avoiding items that are deep fried are your best bet." The site also advised that fast-food places are "almost always high" in calories, fat, sugar and salt. The latest controversy follows reports in October that the McResources Line website had provided employees with a sample personal budget suggesting the need for a second income and not including such items as food or gasoline. Last month, the site also advised employees to get out of holiday debt by returning unopened purchases and bringing a sack lunch to work. As NPR's The Salt blog reported earlier this month, fast-food workers rallied in 100 U.S. cities across the country to protest the industry's low wages, which typically are less than $9 per hour. In October, McDonald's President Jeff Stratton had a public face-off over wages with an employee, Nancy Salgado, a single mother from Chicago. And less than a week later, a study by the University of Illinois at Urbana-Champaign found that more than half of fast-food workers were enrolled in one or more public assistance programs, costing taxpayers an estimated $7 billion annually.